Bichon Frises are known as the happy-go-lucky powder puffs of the dog world. Learn more about this very animated yet strong-willed breed. Bichons developed as a breed in the Mediterranean, and were a favorite of European royalty and nobles for centuries. These dogs made their way across the continent traveling with sailors who used them for barter. Today's Bichon is a descendent of a Water Spaniel known as the Barbet, although some people believe there is some Poodle in the breeding history. 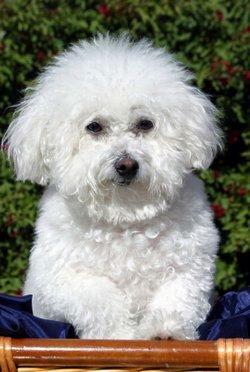 In the early days, there were four basic types of Bichon, including the Teneriffe, Bolognais, Maltais and Havanais. The Teneriffe variety became especially popular in France, and it was this country that officially gave the dogs the name Bichon Frise in reference to their soft fuzzy coats. The breed achieved official recognition from the American Kennel Club in 1973. The Bichon is a sturdy little dog with a slightly rectangular outline. The puffy white coat is the first feature to capture attention, followed by the dog's deep brown or black eyes. The eyes are very round, and seem more prominent against the white background of the coat. The muzzle is blunt with just a slight amount of stop as it meets the forehead. The tail is set high and held curved over the back. The average weight runs between seven and twelve pounds, and most dogs stand between nine and twelve inches tall at the shoulder. These dogs have a very sprightly step, and they can move with clock-like precision. After its distinctive coat, this breed is most renowned for its effervescent personality. Bichons are a bundle of merriment in a relatively small package, and they love nothing better than spending time with people. These dogs love to play, run and explore, but they are also equally affectionate. Overall, they make outstanding companions for children and adults. Additionally, most get along well with other pets in the home. Although intelligent, Bichons tend to be slow to mature, and this does present some difficulty in training, especially house training. Their merry temperament sometimes overshadows the fact that these dogs have strong wills. Any type of training requires consistency until the dog understands what you want from him. Eventually, your efforts will be rewarded. Barking can also be a problem for this breed. Bichons don't bark just for the sake of barking, but they do feel a need to alert you to anything they think you should know about. Some owners find this disconcerting, so excessive barking should be discouraged from an early age. Keeping up such a stylish dog requires quite a bit of grooming. Although this breed is a low shedder, Bichons need to be thoroughly brushed out at least several times a week if not daily. Otherwise, the coat will form mats. Keeping the coat white can also be a challenge. The dogs should receive a full bath every two weeks with a shampoo for white dogs. The hair around the eyes must be kept trimmed to prevent tearing, and the area should be cleansed with a mild eye wash to remove any staining. Aside from routine home maintenance, Bichons need a professional clipping every four to six weeks. You can choose the standard show clip the breed is recognized for or opt for a shorter puppy trim that is easier to manage on an active pet. By and large, Bichon Frises are long-lived dogs, frequently reaching 12 to 15 years of age. Even so, they do face some health challenges that owners should be aware of. Flea allergies: Fleas cause most dogs to itch when bitten, but Bichons can be especially sensitive to the allergen found in flea saliva. Incessant scratching can leave the skin open, irritated and subject to secondary infections. It's very important for these dogs to be on a flea management program. Cataracts: Cataracts are most likely caused by untrimmed fur rubbing against the eyes over the years. It's important to keep the area trimmed back to prevent irritation. Ear infections: A good deal of fur fills the ear canals of these dogs, and this prevents adequate air flow. The hair should be pulled out of the ears each time the dog is clipped to prevent moisture and bacterial build up. Slipping patellas: This condition involves a slight misalignment of the ligaments that hold the kneecap in place, and this can lead to sudden dislocation and pain when a dog is romping around. Bladder stones: These are generally struvite or calcium oxylate crystals that form in the bladder and cause difficulty with urination.